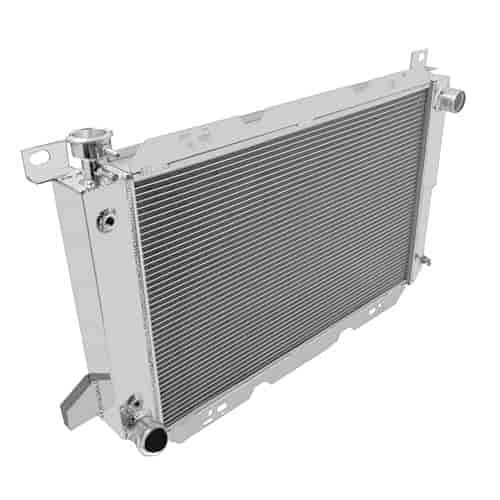 Champion Cooling System Champion Core Radiators have three rows of 5/8 in. tubes that provide cooling capacity for approximately 600 to 800+ horsepower applications. Each radiator is manufactured at an ISO-certified facility to the highest standards and craftsmanship. All Champion Radiators are built with 100% welded seams brazed core technology and absolutely no epoxy. Does Champion Cooling Systems CC1451 fit your vehicle? CC1451 is rated 4.4 out of 5 by 7. Rated 5 out of 5 by RoadKing71 from Great upgrade I picked this up at Jegs while in OH on vacation to replace my 1996 Ford F150 factory radiator. The Champion 3 core unit was not a direct fit. I had to drill holes in the top and bottom radiator flanges to mount the factory fan shroud. And I had to cut part of the lower fan shroud out so the fan would not hit. The botls on the bottom were a bit tricky but overal it was fairly easy to install. There is also a second hose connection on the fill neck which I was able to plug up using a vacuum plug kit that I picked up from the local parts store. After instaling this new radiator my temperature needle never got higher than the O in the normal range. And that was with pulling a Harley Road King through the mountains from OH back to FL. Rated 5 out of 5 by NormH from Solid construction, made in USA. Purchased for my 95 F150 5.8L to get rid of the junk aftermarket radiator that was already leaking at 2 months old. This solid aluminum radiator is a perfect upgrade. Tech note: this rad is thicker than the stock one so it will push the lower rad hose into the steering gear box, a simple rub pad on the lower hose to prevent damage to the hose and you are good to go. Also this rad holds about 30% more coolant so buy another gallon when you go to do the repair. Rated 5 out of 5 by Natethetank from Great product I have a 25 year old 460 big block that is my daily driver. I was hunting online for a all aluminum radiator to keep the engine cooler in the summer months. And found some cheap knockoffs. I ordered the jegs radiator standard freight and it was at my door when i got home from work the next day. I was worried about having to do modifications but the only thing i had to do was block off the trans cooler ports, because mine is a stick. And also block off one overflow port. No big deal. The factory shroud was a direct fit. While driving the engine runs 40 degrees cooler, exactly was i was wanting. Thanks again jegs for keeping american muscle on the road. Rated 5 out of 5 by Broncogirl87 from Great Radiator Bought this to replace a leaky radiator on my 87 Ford Bronco. I wanted a quality all aluminum radiator that was made in the USA. The last replacement I bought was a cheap aluminum radiator from another country, I was in a bind and it was all I could get during a major holiday weekend. The visual difference was quite noticeable. It's built very strong and strudy, not to mention it sure shines! Keeps my engine running cool, so cool that it's almost below the normal mark. I will buy from Jegs again! Rated 3 out of 5 by DnaRna from Great product Easy to install, great performing product, not a perfect match for my engine year combo. Had welded in outlet before the pressure cap. I contacted jeg and their answer was I needed to plug it. Had to go and buy more parts to finish the job. What is the PN for Transmission radiator cooler adapter (did not come with any)? I want to use the radiator Trans cooler with an additional cooler inline. They use a 1/8 npt fitting, so it will depend if you wanting to use it with a barb fitting or an line.